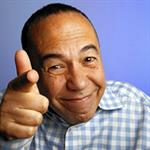 Comedian, actor, and voice artist best known for his numerous film and television roles and for hosting Gilbert Gottfried's Amazing Colossal Podcast. Dara Gottfried's husband. — Fun Facts: Gilbert recounts when E! News announced that Michael J. Fox had Parkinson's disease like it was a fun fact. Gilbert decides to announce that Arnold Schwarzenegger literally has no testicles.